Optimized doping (Mg, Si, Zn,...) and reduced impurity incorporation (H, C, O, metals) are essential for high efficiency LED devices. Using dynamic SIMS, depth profiles can be recorded up to several microns within minutes, with detection limits from the ppm down to the ppb range depending on the species to be analyzed. Dynamic SIMS also offers high depth resolution, which has been widely used for ultra shallow implant technology. Therefore, the CAMECA SIMS instruments are extremely useful in investigating the composition and characterizing the elemental distribution of dopants and impurities on different layers, making them your best choice for R&D and process control of novel LED devices. Based on a magnetic sector mass spectrometer, the IMS 7f-Auto achieves benchmark performance in terms of sensitivity, depth resolution and mass resolution. Depth profiling data are routinely obtained for both matrix and dopant species. Experimental conditions are selected in order to provide the best detection limits for both p- and n-type dopants and to ensure optimized throughput and ease of use. 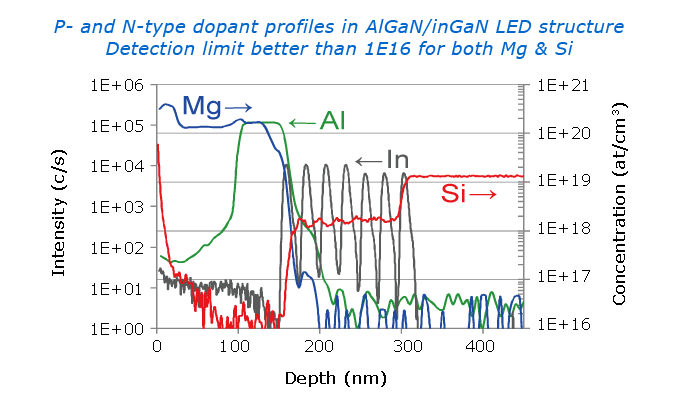 In LED compounds, undesirable contamination of H, C and O into defects of GaN crystalline structure affect the electrical properties and shift the intended emission wavelength. Thanks to the optimized vacuum in its analysis chamber and high brightness primary beam bombardment, the IMS 7f-Auto outcompetes all other analytical instruments on the market for the analysis of light elements. Detection limits for H, C, O are unequalled.